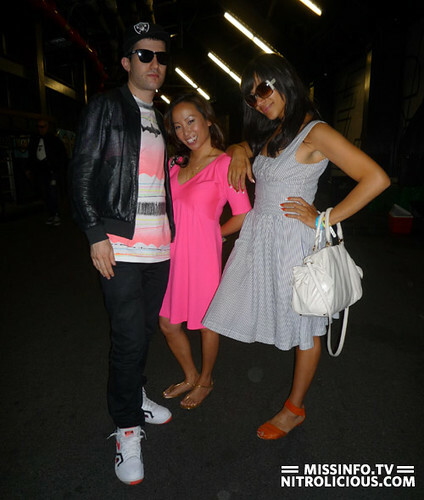 ***ok, so first off…this pic makes Atrak look like a giant! I mean, sure, I’m small, but I’m like a pygmy here. Also….this pic makes it look like Kid Sister has one leg. Either her other leg is tucked in her skirt, flamingo-style….or, she’s got amazing balance. Oh man this is hot fire! I’ve been following Kid Sister from the jump. I’ve been waiting for a new release. Thanks info. I always see Santogold, Kid Sister, and MIA in the same group of artists who sound alike. They need to do a collaboration. This looks like a really bad Photoshopped pic! There’s no shadows and the perspective is all wrong? Info and Kid Sis look like they’re floating! Song’s ai-ight I guess, it’s a club track. Sounds like it would work good in a club, or make a real colorful video. Not my style per say, but the song does sounds fun. Remember fun in Hip Hop? yeah..where’s kid sis other leg???? info you always look so jolly in pictures.makes me think of christmas day. I’ve been trying to get at Kid Sister’s juice box since “Pro Nails”….Kid Sister, I can be your “My Buddy”….someone shoot at me for that one please…LOL, because this is a post 9-11 world and Wamu is trying to stick me for my papers, Damn. Kid Sister is just one-legged? No wonder we don’t kick it like we used to! Banner made it that much better for me. Makes me wanna listen to Goodie Mob “Soul Food” though.